You need Hurricane Doors which will keep out destructive high speed winds and the bad guys; we, at Gold Coast Hurricane Shutters and Fence, manufacture, supply, and professionally install them, and our prices are low. We are the preferred hurricane shutter manufacturer for leading home builders and contractors. Get heavy savings with us! We are direct manufacturers of our Hurricane Doors and other products. If you find lower prices, we will gladly try to match them and beat them. We look forward to professionally serving your Hurricane Doors and Storm Protection needs for many years to come. Hurricane protection is not expensive; it is quite priceless! 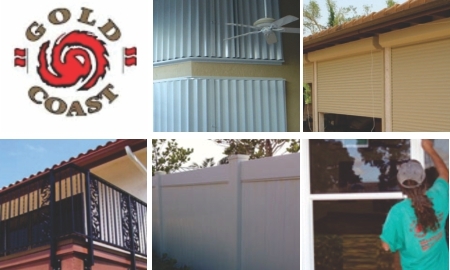 Gold Coast Hurricane Shutters and Fence, is South Florida’s leading Hurricane Doors production company. Gold Coast, family owned and operated, with many years of experience, focuses on customer satisfaction, at all times. We have served our local Florida and Texas communities, with great distinction, and the best prices, and professional service in the industry. We offer the highest-quality hurricane protection products, at the most competitive prices. Gold Coast manufactures, supplies, and installs, a large variety of hurricane protection products. You can be confident about using our excellent products and services. As one of the largest hurricane door manufacturers in the world., we are in the advantageous position, of giving you, our client, the lowest prices in the sector. All of our Hurricane Doors, and Storm Shutters, are Miami-Dade, Broward and Palm Beach Florida building code approved. Gold Coast also offers a full line of fencing, including aluminum fences, as well as aluminum balconies and gates, in any design, style or color. We tailor everything to your dimensions and needs; we are flexible. Why look elsewhere? We are your complete one-stop-shop, when it comes to proper Hurricane Protection. By using us, you are also enhancing the market value of your home.